Yellow Color DC Jack (65W) version and Blue Color DC Jack (90W) version are interchangeable, we ship by our stock status unless customer indicate while placing an order. 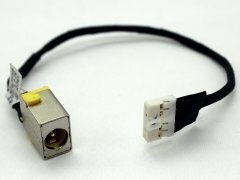 Note: Laptop manufacturers may use a different Power Charging Socket DC IN Cable for Acer Aspire MS2360 MS2361 Series. Please enlarge the picture in this page and compare with the original item in your laptop. The customer is responsible for ordering the correct laptop parts.